One walk or drive YOU MUST DEFINETELY undertake, or should I call this a hike, is walking, hiking or driving up the Conor Pass. The views to the north and south side of Dingle peninsula are stunning, and the whole walk up there is a true adventure, as the ascent is pretty steep and the road is narrow (to put it mildly). Negotiating the pass, which links Dingle Town on the south to Kilcummin on the north coast at Brandon Bay, is a must-do experience. Walking is better than driving as you can take in the whole scenery as you walk along. 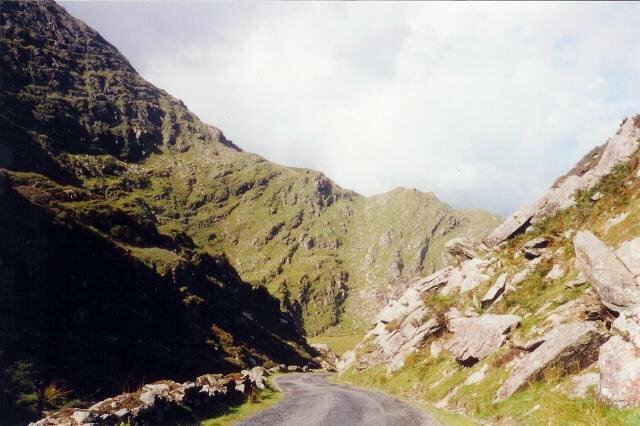 Conor Pass or Connor Pass “An Chonair” inIrish is one of the highest mountain passes in Ireland served by an asphalted road. It is located on the R560 road in the middle of the Dingle Peninsula. The 456-metre (1,496 ft) high pass connects Dingle, on the south-western end of the Dingle Peninsula, with Brandon Bay and Castlegregory in the north-east. A twisty one-lane asphalted road leads to the pass. The drive, inadvisable in bad weather, is considered one of the most beautiful of Ireland. However there are many places to pull over and soak in the scenery even with the clouds. Once we stopped in the clouds and with the towering rocks above and below, I actually had trouble getting my orientation. This wasn't a problem driving, just walking. The Mountains the Pass crosses are the Brandon Mountains and contain Ireland's second highest peak Brandon Mountain at 3127 ft.
Leaving Dingle town from Spa Road, the paved way becomes increasingly narrow and (depending on your sense of adventure) thrilling/terrifying until it crests at 1,500 feet above sea level. The rugged terrain through which you climb looks like some sort of moonscape. From Dingle Town the road runs some 4½ miles rising to 1500 ft as it winds its way to the pass. There are wonderful views of the coast. At the Pass there is a car park where you are confronted with this magnificent sight. The views from the road are breathtaking, as the glaciated landscape of mountains and corrie lakes comes into view. From Dingle Town the road runs some 4½ miles rising to 1500 ft as it winds its way to the pass. The scenic road leading to the pass weaves its way around the sharp cliff faces and past high corrie lakes. Vehicles over two tonnes in weight are prohibited from using the road in order to avoid difficulties in passing. Bicycle ascent to the pass is one of the most famous and difficult climbs in Ireland. There is an old building at the top of Connors' Pass which is a grotto dedicated to the starving and the dying of the area at the time of the great Misery in Ireland known to us all as 'The Potato Famine' but it was a lot more than just potatoes. The Dutch artist Rene'Van Linde wrote about the view he painted of the Pass as " Magnificent" he was right, you should see his painting, 'tis beautiful. Then Dan constantescu wrote about Connors pass, saying, "The View is Moody! Due to the speed of the changes of the views due to the speed of how the weather changes" probably because the Sun is filtered by the passing clouds. It is incredibly narrow at one point and only one car can pass at a time…and then you literally have to forge a small river while hugging a small precarious “protective fence barrier” that wouldn’t hold the weight of a person, let alone the car should it be necessary. Once you get through the confined mountain passage you are able to creep down the steep and winding road. But you know, once you get through all that you’re totally fine! Your only regret is that if you are the driver you won`t be able to completely enjoy the beautiful landscape as you descend the comb, or rather the amphitheatre-like valley formed by glaciers. The road then carries on down towards Brandon Bay past cliffs, a waterfall and lakes. When you emerge from the pass on a foggy day you will have sunny blue skies and beautiful beaches to greet you. · My wife and I drove the Conor Pass (towards Dingle) this past May. The weather was cloudy and the ceiling was just over the top of the Pass. The views were spectacular. We had some concerns about the dangers of the trip because of some of the postings that appeared on this and other internet sites. However, we found that the route was not really difficult at all. Descriptions like: "the left wheels hanging over the edge" were not accurate. A short stone wall precluded a fall over the edge most of the way. Several 'carve-outs' were provided at the narrowest spots so that cars could pass each other. I highly recommend this drive, unless the overcast is too low, thereby obscuring the views from the top. · I suggest you plan the Connor's Pass for both ways...because you might find that one of those times you cannot do it because of the weather, and then you would miss it altogether! We were so happy that we drove the Connor's Pass when we travelled from Bunratty to Dingle. We then stayed in Dingle for 3 nights. We were hoping to do the Connor's pass again when leaving Dingle, but the weather was bad, so visibility would have been poor and the drive would have been too dangerous. So we went from Dingle to Ballyvaughan avoiding Connor's Pass. If you put Connor's Pass in your itinerary going in both directions, that way you won't miss it due to weather! Our trip was in July 2006. Enjoy! Connor's Pass was gorgeous; it looked like a peek into heaven to me. The road on the south side of the pass has been widened considerably and is an easy and safe ride in either direction. As far as which is in "inside" lane: Heading south on the Conor Pass road from Castlegregory (Blennerville, Tralee etc), as you climb (driving on the left hopefully), you will be in the lane furthest from the cliff edge. The cliff is to the right. As you descend going in the same direction, the drop off is to the left instead of the right so you will be closer to the edge. The edge is much less frightening on that part of the road. For the most part, the drive has gotten much easier. I don't know if the plan to widen the last section which will probably infuriate the locals who seem to enjoy the ride. Of course, most of them have lived there all of their lives and are quite used to it. This is of course, the cause for the discrepancy in drive times between what locals seem to think it takes and tourists, especially those from the States who are not used to driving conditions that require constant attention to both traffic in your direction and in the opposite direction. Roads in the States are not only always wide enough for two large vehicles comfortably; they generally have plenty of room for a biker on the side. You can always tell the tourist driven car in Ireland by the brake lights coming on every time a car approaches in the opposite direction. Granted, for the most part, N roads, especially those in the single digits, are wide roads with plenty of shoulder, sometimes wide enough for slower traffic to pull out of the way for faster moving traffic. Once you hit the smaller roads though, things get narrower. Drivers from the States aren't used to clearance from passing vehicles' mirrors being about a foot at 60 MPH. Thus, they hit the brakes. That 100 KPH speed limit just becomes a lofty goal as opposed to a requirement for them. My wife still gets nervous when I drive the limit on smaller roads so usually I have to slow down to keep her from hiring a lawyer. The average driving speed is probably on the increase in Ireland and may be up from the 35 MPH that it used to be for tourists. In the discussion from a poster (who never responded) on driving times to Dingle I used 35 MPH which was probably too conservative given roadway improvements on that route. By passes now exist around Naas, Droichead, Portlaois and formerly the slowest area Limerick which have probably taken more than an hour off the drive time. I can see that a tourist could make that drive in roughly 5 hours without stops. Once you get off those main roads though, the average speed drops precipitously. If you love Hiking and mountain climbing then you must try your skill at these. By the way have you any stories or information or help concerning climbing in County Kerry you would like to offer? If so please email me at the link below and I will add it to the appropriate page.